“WATERPROOF” IN WINTER 2010 ISSUE OF THE BATTERED SUITCASE! 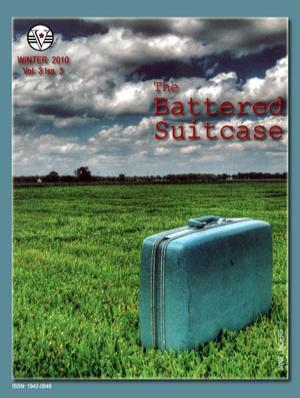 My short story “Waterproof”—which Battered Suitcase editor Fawn Neun called “eerily touching”—is now available in the magazine’s Winter 2010 Issue! This story was part of my Bachelor’s thesis at Burlington College and was written in 2006. It stayed hidden in a drawer for many years, and after many people who had read early versions of it asked me when it would be available in print, I went in search of a home for it earlier this year. The Battered Suitcase was it! Posted on January 3, 2011, in News, Short Stories and tagged Short Stories, The Battered Suitcase, Vagabondage Press, Waterproof. Bookmark the permalink. Leave a comment.